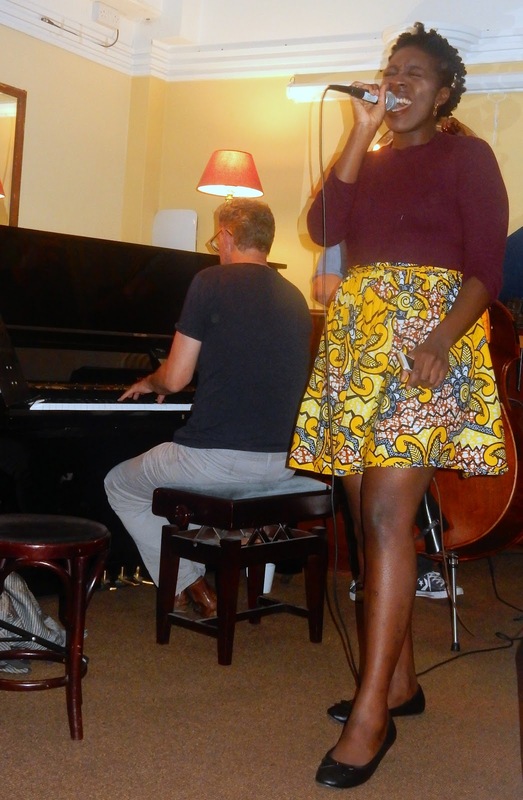 The fortnightly Jazz Café jam returned and with it, jammers old and new. As per the norm, the house trio got the ball rolling. Alan Law, this week's pianist, set the bar with a solo on Bye Bye Blackbird that was just sensational. If I'd have left there and then I'd have still had a good evening. As it was, although nothing quite topped that, there were several who came close. It was a pleasant surprise to have a return visit from Polish Australian (or is it Australian Pole?) Podstowek. The genial, multi-instrumentalist was last here in November 2015 when, as well as playing drums and blowing melodica, he also sang - quite a character. Neville Hartley is now a regular and Indian Summer and Autumn Leaves added a seasonal flavour - next time Winter Wonderland? David Marsh, up from Oxford, blew flugel on There Will Never Be Another You and later played piano. The frontline of Marsh, Jamie Toms and Marek really blew up the proverbial storm. As always, the vocal dept. was well stocked with Kate O'Neill surprisingly - and effectively - relatively restrained on Solitude followed by You Make Me Feel Like a Natural Woman. Less restrained was Niffi on I'm Beginning to See the Light and Get Happy - we did! Chloe Watson returned after some months' absence and reprised At Last à la Etta. Poppy, a newcomer to the scene played flute and sang on Corcovado as well as singing I Will Wait For You. A work in progress at present, it will be interesting to chart her development. As well as Marek on drums (photo by Russell) we also had Mo and, of course, this week's resident stickman Tim Johnston. 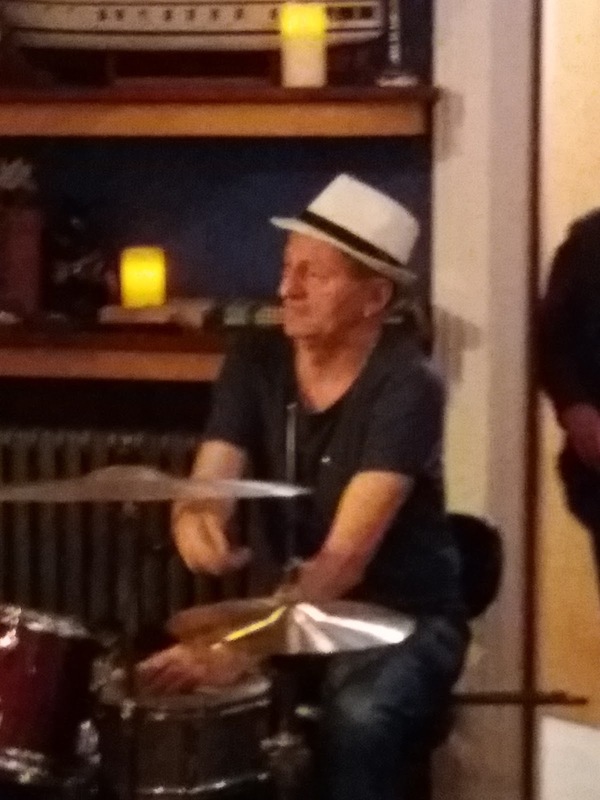 There's never a shortage of drummers but bass players are at a premium so Paul Grainger's fingertips must have welcomed the arrival of Steve Brown and his Africa-bound son Joel. Paul, whose newly cropped hair makes him look more like Chubby Jackson than ever, handed over the big bass viol to Brown senior whilst Brown junior took over on piano to remind us of how much he will be missed when he goes, I presume, in search of Dr. Livingstone. I've mentioned Jamie Toms who knocked everyone out with some ultra cool modern tenor playing but, prior to Jamie, John Rowland also blew impressive tenor on Cottontail and Moanin'. Two different stylists but both swingers. As ever, I had to leave before the final push so my apologies if I've missed anything or anyone out. Alan Law (piano); Paul Grainger (bass); Tim Johnston (drums) + Neville Hartley (trombone); Marek Podstowek (drums/melodica); Kate O'Neill, Niffi Osiyemi, Chloe Watson (vocals); Poppy ? (vocals & flute); David Marsh (flugel/piano); John Rowland, Jamie Toms (tenor); Hazem Mohammed (drums); Joel Brown (piano); Steve Brown (bass).